Product prices and availability are accurate as of 2019-02-19 20:29:59 EST and are subject to change. Any price and availability information displayed on http://www.amazon.com/ at the time of purchase will apply to the purchase of this product. An all-in-one Pump Aerator Kit to fill, aerate and empty any livewell. Adjusts to any size insulated cooler, livewell or container. Spray bar mounts with suction cups or stainless steel screws. Suction cups allow pump to be attached inside the live well or to the outer hull for water renewal. 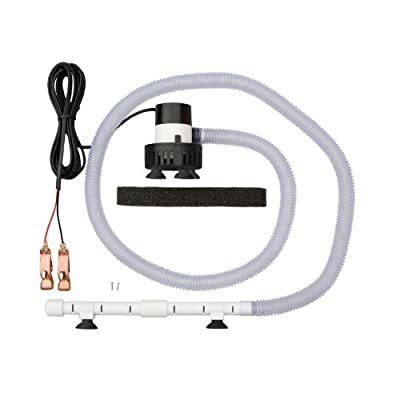 Complete package includes: 500 GPH pump with, suction cups, 10' 16 AWG power cord and copper battery clips, 2 aeration spray pipes, mounting clips, 5.5 ft. flexible tubing, fish foam filter, screws and suction cups for mounting. Great for freshwater or salt water. Suction cups allow pump to be attached inside the live well or to the outer hull for water renewal.